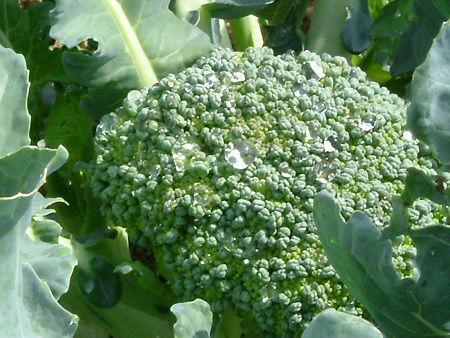 Mother Nature’s marvel: A power-packed food that K.O.’s cancer! It’s true! Savvy scientists have come up with positive proof to back up what your dear old mom knew all along – a little broccoli every day will keep the doctor away! I thought I’d start this post out like a supermarket tabloid story, with the sort of splashy headline you see while languishing in an otherwise boring checkout line. A stunning new medical miracle, according to the teaser. But like a lot of some a few tabloid stories, this one has a kernel of truth. Writing in the professional journal Molecular Cancer, researchers discovered that a chemical in broccoli, called sulforaphane, interacts with cells lacking an essential gene (PTEN) that reduces the chances of prostate cancer developing. In cells that already express PTEN, eating broccoli isn’t going to do you much good. But if PTEN is lacking in those prostate cells — and who knows if it is or isn’t — eating broccoli regularly could make the difference between a healthy life and putting your urologist on your Christmas card list. The good thing about these miracle foods is that you don’t have much to lose by giving them a try, unlike some experimental drugs that turn out to have fairly wretched side effects years later. So, why not rush right out to your produce market and pick up a bundle of broccoli? Try it today! Another chapter in the long-running sage of the Uncivilized Society: Social science researchers have come up with a theory that the more compensation top corporate execs receive, the nastier they may be to their employees. This theory has been dubbed “Trickle Down Meanness” by blogger Maxine Udall (girl economist). Check out her July 23 post for details. We are in the midst of almost unprecedented budget tightening worldwide as government wakes up to the fact that deficits have spiraled out of control. The financial news site Calculated Risk recently ran a four-part series on sovereign debt around the globe, and it was sobering to see the statistics pulled together. Now, it’s certainly true that a lot of the recent run-up in sovereign debt stems from domestic and international efforts to stabilize the banking system. Whether governments should have backed up as much private bad debt as they did is another argument entirely. But there is another gorilla in the room, and this one hasn’t received as much attention. The story is just beginning to come into focus though – and that is the staggering amounts of debt that state, county and municipal governments are facing as they try to balance budgets over the next two years. Layoffs, pay cuts and pension reductions are on the table. It turns out that pension benefits in particular had become too generous, at least partly because states thought they could safely invest funds in instruments like credit default swaps and mortgage backed securities – which turned as we know to be nothing but ticking time bombs. Amidst all of this number crunching comes health care reform. And it doesn’t get much discussion – the mandatory purchase of health insurance seems to be the centerpiece, and the thorn in the side of the law’s opponents – but the lion’s share of expanded coverage over the next several years will come from more Medicaid enrollment. Medicaid is administered by the states with federal funding. States are already debating how to fulfill health care mandates without a huge influx of cash from the feds. The upshot is that leading up to the health care reform mandates in 2014, states are busy slashing state Medicaid budgets. In other words, states are on a collision course with the feds, who plan to toss 16 million more Medicaid patients in to the rolls. Don’t look at this as a looming problem for the future, though – the future is now. Brandeis University has published a new study showing that cash-strapped agencies are feverishly axing budgets for mental health treatment, not only here in the U.S. but worldwide. This at a time when more and more people are suffering with mental health issues due to widespread and persistent unemployment. Based on 2009 surveys, 32 state mental health agencies have cut their budgets an average of 4.9 percent, eliminating programs for both children and adults. Relief does not appear to be on the horizon, as the economic recovery has been faltering this summer, according to government data. Push is already coming to shove. One Arizona Medicaid official told The Wall Street Journal last week that state and federal officials are “living in a parallel universe,” with two views that are totally at odds. We would all like to believe that congressional leaders are huddling with Obama Administration officials to work out a solution. Why do I think that summer vacations – and the fall election – are a lot higher on their priority lists? Doctors will soon be able to conduct new tests for Alzheimer’s disease, the terrifying disorder that wreaks havoc with families and forces them to watch anxiously as loved ones slowly fade into helplessness and isolation. Using new diagnostic guidelines expected to be in place this fall, the number of patients with the illness could triple. Soon, according to an article this week in the New York Times, physicians will be able to do brain scans on people as young as their 50s to determine if they have “pre-clinical” Alzheimer’s – though they may have no symptoms. The new diagnostic approach was hailed throughout the article because it would allow people to “plan” – and may even lead to treatments that would prevent or delay the onset of the disease later on. But that is a very optimistic and benevolent view of the American health care system, and the employment structure that unfortunately will soon be working in its shadow. It presupposes that all of the mechanisms of society are working in harmony to smooth the way for folks as they roll through life and deal with new – and heretofore unexpected – problems. Excuse me for being a cynic, but I have to question whether this kind of information – a medical diagnosis that will in fact be viewed by most as a hard and fast prediction of what’s to come – will be used strictly for the betterment of patient health. To put it more bluntly: A 50-year-old patient who has been diagnosed with a serious “pre” condition of any kind – particularly a behavioral disorder – will have about as much chance of landing gainful employment as an ex-con applying at a daycare center. Oh yes, I know. Federal regulations strictly prohibit the dissemination of private health care information and so that type of diagnosis would never get into the hands of a prospective employer. That’s why we have HIPAA. Problem is, it’s become the standard assumption that older people will by economic necessity have to work longer into their careers. President Obama’s National Commission on Fiscal Responsibility and Reform – nicknamed by some malcontents the Cat Food Commission – is likely to recommend raising the retirement age yet again. Former Fed Chairman Alan Greenspan is on record as saying that since Americans are living longer, they ought to be working longer. That makes sense in theory, until you start nosing around the nooks and crannies of the corporate hiring process. It’s hard not to conclude that prospective employees with looming health care problems are going to be shuffled unceremoniously to the back of the line. Way, way, back. So you’ll pardon some of us who aren’t breaking out the party favors over medical advancements that will saddle currently healthy people with a label of future medical crises. Especially when they will have to convince human resources folks that they’ll be a great asset to their company. Does anyone else see a potential train wreck coming here? People are funny, Art Linkletter used to say. But sometimes not so funny. I was sitting in a movie theater when it happened. In the middle of the row, second seat from the front, where I usually don’t like to sit because let’s face it, it’s a popular spot. The risk of sitting next to a talker is high, and I find talking during a movie to be very troubling. Very, very troubling. In this case, two women sat down in the seats to my right and started chatting, but cut it off after the previews. I figured I was good to go. But then the hacking started. Mostly coughing, with a couple of sneezes thrown in for good measure. And during none of them – not even one – was there any attempt to cover the mouth. First one of them coughed, then the other; sometimes both. Obviously, they were both ill.
OK. 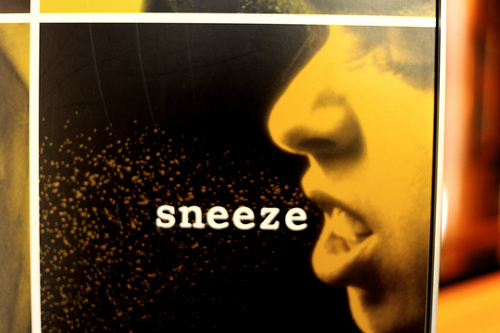 This is an extreme example, but a new study says more than a quarter of all sneezers and coughers don’t bother to cover their mouths. And less than 5 percent cover up the way health care professionals say is most effective at stopping germs from getting spread around. The research was based on public observation in Wellington, New Zealand, and the results were presented this week at the International Conference on Emerging Infectious Diseases in Atlanta. the elbow – which is recommended by public health officials. When people did cover, the overwhelming majority (64.4 percent) used their hand. A follow-up survey – the original observations were made in 2009, during the height of the flu pandemic fears – showed that if anything hygiene behavior had gotten worse, probably as flu fears waned. Oh, I know – that’s New Zealand. Americans are much, much more considerate. Except that once you’re scathed, it takes a heck of a long time to recover. A lesson that vigilance is required when you live in a world that earns a not-so-solid D-minus in respiratory hygiene. Have we gone over the top in our efforts to boost young people’s self-esteem? Some psychologists say yes, that we’ve built up kids’ confidence to such a degree that they crumble at the slightest hint of failure. It became gospel in education circles that children should be sheltered from any negativity, any suggestion that they can’t accomplish whatever they want. 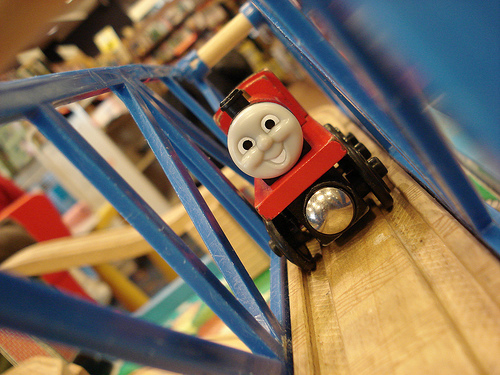 What we have now is the Little Engine That Could on steroids. Expectations are not only high, they’re off the charts. But now psychologists like Jean Twenge, of San Diego State University,are questioning whether we’ve been setting our youth up for unrealistic expectations. And keep in mind that these issues may be finally bubbling to surface now that the economy has been ravaged by a long recession. In other words, over confidence is running into the roadblock of reality for many people, particularly younger folks who just assumed that a college degree would put them on a magic carpet ride to a fabulous, upscale lifestyle. “There has been a pretty big shift in expectations. 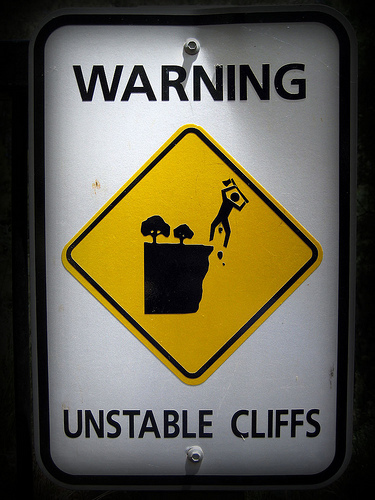 Adjusting to reality is going to be different,” Twenge said in a recent interview with the Chicago Tribune. In her website blog, Twenge correctly ties it all in with the debt bubble that’s been ballooning in America for the last 30 years – and absolutely exploding in the last 10. The self-esteem movement is far from dead, though, despite the economy. The idea that the last two years represent a mere stumbling block on the road to riches persists, particularly in the mainstream media. I don’t think anyone is arguing that kids, teens and young adults shouldn’t develop confidence and a good grounded sense of self-esteem. But parents and teachers should be responsible for letting their kids understand that not everything is going to be a cake walk. Otherwise they’ll have to find out for themselves, the hard way. I like the idea of city living in a neighborhood with quirky food shops and restaurants within walking distance. And you would suspect that this would be a fairly healthy lifestyle – staying out of your car, for the most part, and hoofing it when you want to get a bite to eat. But a new study by the University of Buffalo says that just because an urban location encourages walking doesn’t necessarily mean it will lead to a trimmed-down population. UB researchers looked at how environmental factors play a surprisingly big role in obesity. What’s interesting is that apparently the development of “mixed use” neighborhoods – in which residents can find a variety of services close to home – actually encourages obesity when that mix includes a lot of restaurants. 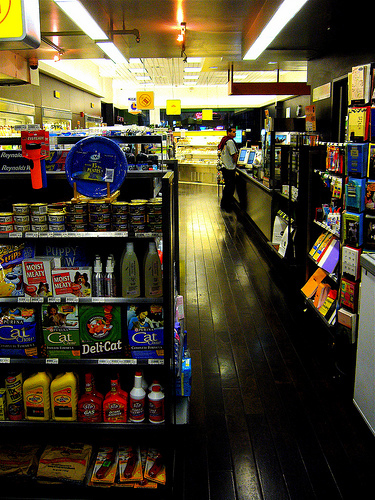 Convenience stores are another culprit, according to urban planning researchers who gathered the data. “We have attempted here to explain the paradox of high BMI [body mass index] rates among women living in highly walkable inner city neighborhoods,” said lead researcher Samina Raja, professor of urban and regional planning at the university. The study focused on women but I don’t see why it can’t be more broadly applied to both sexes. “First, a greater number of restaurants within a five-minute walk of a subject’s house was associated with a greater BMI [body mass index], holding other factors constant. “Second, on average, women who live within relative proximity to supermarkets and grocery stores (as opposed to convenience stores) tend to have lower BMIs. Some cities are offering to let developers exceed density restrictions in exchange for incorporating healthier food outlets into their planning. They include New York City, Madison, Wis., Marin County, Calif. and Harrison County, Miss. 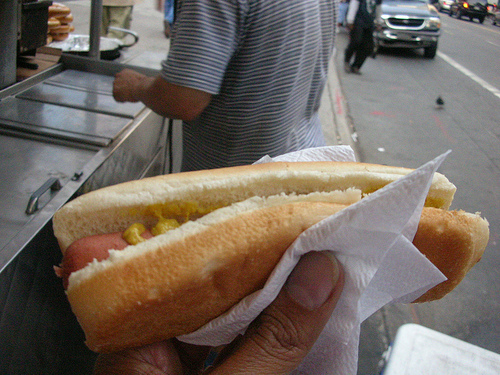 There are several times each year when a hot dog is a must-have. The first spring training game of the year in March – that’s a given. In fact, at any baseball game one of the first things I’ll do is go up to the snack counter for a dog, with a generous helping of kraut. There are a couple of other events in my hometown – West Palm Beach – that also require at least one tube steak. One is the music-oriented SunFest in May and other comes up this weekend, at an event called Fourth on Flagler. Well, hotdogs taste good, you get them fast and they’re just so doggone handy. But family members sometimes stare in disgust as I’m wolfing one down. They are a traditional All-American food, but they are not known to be an important part of a healthy diet. My mother once pulled about a two-inch strip of fur out of a hot dog and never touched one afterward. I’ve never had that misfortune, although I’ve occasionally bit into a rogue piece of bone. A guy I recently interviewed, who worked for the World Health Organization, said he made it a policy never to eat food from a street vendor no matter where he traveled – including the U.S. But I bet he makes an exception for sporting events. So every once in a while, you begin to wonder what’s in a hotdog and I guess the Fourth of July weekend is one of those times. “The ingredients in hot dogs have been the subject of much humor, rumor and speculation,” acknowledges the National Hotdog and Sausage Council. Then of course you have your spices and the all-important sodium nitrite, the corner stone of any mouth-watering prepared meat product. Turkey or chicken dogs can contain skin and fat, according to the U.S. Food Safety and Inspection Service. By the way, the definition of meat was changed in 1994 (thank you, Bill Clinton) so that bone scrapings produced by “advanced meat recovery” (AMR) machinery can be labeled as meat trimmings. There’s also something called “mechanically separated meat” or MSM, which is a paste produced by forcing bones with meat scraps through a sieve to retrieve the edible meat. Producers can only do this in the U.S. with pork, not beef, due to mad cow disease. OK, I looked for hot dog horror stories but couldn’t find anything that matched my mother’s furry experience. However, I did come across an interesting post on NaturalNews.com, in which the editor shot high magnification photographs of prepared meats he had purchased from the supermarket and brought home for that purpose. “I took these pictures in my own kitchen (which turned out to be a problem because my kitchen soon reeked of processed meat odors),” the editor wrote. He also said he thought feeding hotdogs to children was a form of child cruelty. You can check the pictures out for yourself although you may want to wait a few days so that you can maintain maximum mystery meat enjoyment throughout the holiday weekend.